What are Flat Feet? They are super innovative “Blanks” created by Conjoined Creations. You simply pop the waste yarn bind off, unravel and start knitting! The colors are fabulous and they are going fast!! 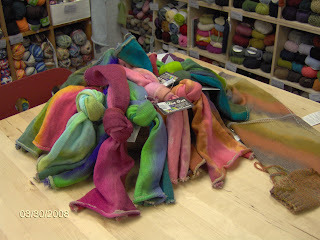 Imagine knitting hand dyed socks without having to wind your yarn? No balls rolling around. No tangles. You can fold up the blank and take it with you any where. Cid’s designs are fun & whimsical and the patterns are very well written. Come check out this local designer during the month of April! Bring your favorite little person with you. They will fall in love with one of the delightul little friends for you to knit especially for him or her!! >Stupid question maybe, but since it is May now, do you still have or carry the Cid Hanscom patterns? Thanks. >Hi, Kelli! It’s not a stupid question. 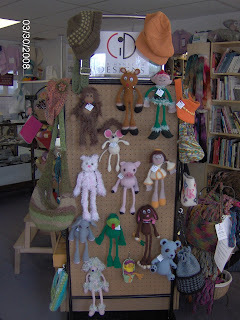 We do still have Cid’s patterns in the store; we just don’t have a lot of finished items on display. So, come in and look at the patterns!